The Main Page of OSDM. 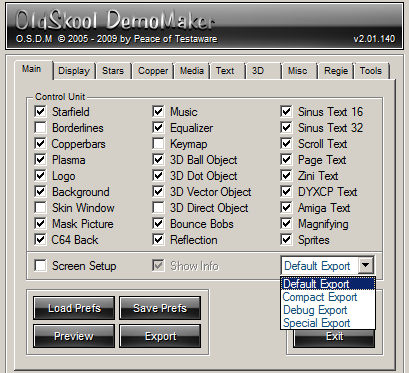 Here you enable or disable the effects that you would like to use in your OSDM intro/demo (Control Unit Frame). Important: If you did not enable an effect here, it will not be shown in your final intro executable nor preview, regardless, if you specified settings for it or even call it via the CAL command in OSDM Script. Debug Export - Creates a much larger executable for debugging purposes. It also allows you to enable/disable the "Show Info" checkbox. If "Show Info" is enabled, OSDM shows on top of the screen technical details of the production while it is running, like Intro Time, Sub Procedure executed (OSDM Script), Coordinates, NOP counts and others. Screen Setup: On/Off - If you want to allow users to specify the screen resolution and if they prefer to run your production in Windowed mode rather than Full Screen, enable this option. Note: you also have to configure the Display settings for your intro accordingly. ... List with various possible resolutions, which depends on the resolutions supported by the current graphics cards. FPS - Frame Rate (Note: The Frame Rate setting has direct impact on any "Speed" or "Delay" settings of all active effects, so you should decide on this setting as early as possible. Rule of thumb: the higher the frame rate, the smoother the effects (in most cases), but also the higher the resources usage and power requirements. Depending on the type of production, I recommend to choose between the frame rates: 15, 30 and 60. Display Size (in percent) = 1-100, leave it at 100 unless you are going to use either a "Border Line" or "Misc\Skin Window" Effect. 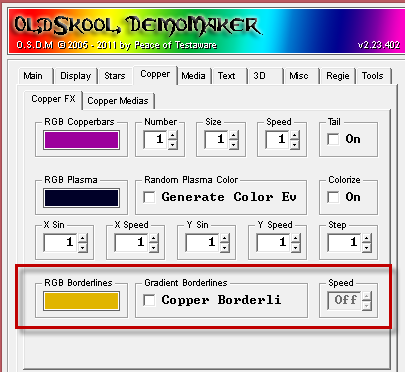 Several Effects of OSDM support what is called a "Copper Effect". 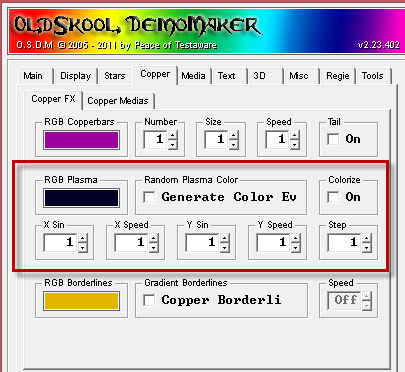 Although the traditional Copper Effect is based on the manipulation of the palette in the display memory of the computer, the same effect is emulated by OSDM by using a pre-defined image with the desired color cycling effect instead. 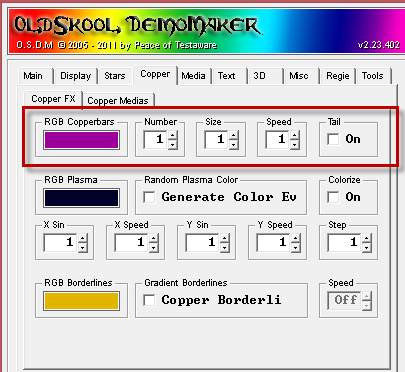 The Copper FX tab controls 3 individual effects, which must each be enabled specifically in the "Main" tab.